The MAV assembly described in the paper. Maryland Robotics Center Director and Professor S.K. Gupta (ME/ISR) and four of his colleagues have won the Best Paper Award in the complaint mechanism category at the 34th ASME Mechanism and Robotics Conference. "Design and Fabrication of a Multi-Material Compliant Flapping Wing Drive Mechanism for Miniature Air Vehicles" details design and fabrication methods for creating a multi-material compliant mechanism to realize a micro air vehicle (MAV) drive. Gupta's co-authors are his Ph.D. student Wojciech Bejgerowski; his former student and recent M.S. graduate John Gerdes (now at the Army Research Laboratory); Professor Hugh Bruck (ME); and Stephen Wilkerson of the Army Research Laboratory. 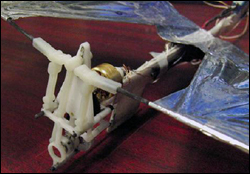 The mechanism described in the paper was implemented in a successfully flying MAV prototype, and the methods described by the paper are applicable to any light-weight, load-bearing compliant mechanism manufactured using multi-material injection molding.